You will need 1 x 23cm / 10in deep-sided,loose-bottomed flan tin. Snap the biscuits into pieces and drop them into the bowl of a food processor. Do likewise with the chocolate, then blitz them together until you have crumbs. Add the butter and salt, and blitz until it forms fine crumbs. Press into your tart tin and pat down on the bottom and up the sides of the tin with your hands or the back of a spoon, so that the base and sides are evenly lined and smooth. Put into the fridge to chill and harden for at least 1- 2 hours. I wouldn’t keep it for longer than a day like this as the Oreo crust tends to get too crumbly.Filling: Finely chop the chocolate. Put the cornflour into a cup and whisk in the milk until smooth. I use a very small whisk for this,to get rid of lumps – as the cream heats and the chocolate starts melting. Off the heat, whisk in the cornflour and milk mixture until it, too, is smoothly incorporated, and put the pan back on a low heat. With a wooden spoon, keep stirring until the mixture thickens, which it will do around the 10-minute mark, but be prepared for it to take a few minutes more or less. Take the pan off the heat every so often, still stirring, so that everything melds together, without the cream coming to a boil. When ready, it should be thick enough to coat the back of a wooden spoon, and if you run your finger through it (across the back of the spoon) the line should stay. Pour into a wide measuring jug or batter jug (it should come to about the 600ml/2 ½-cup mark). 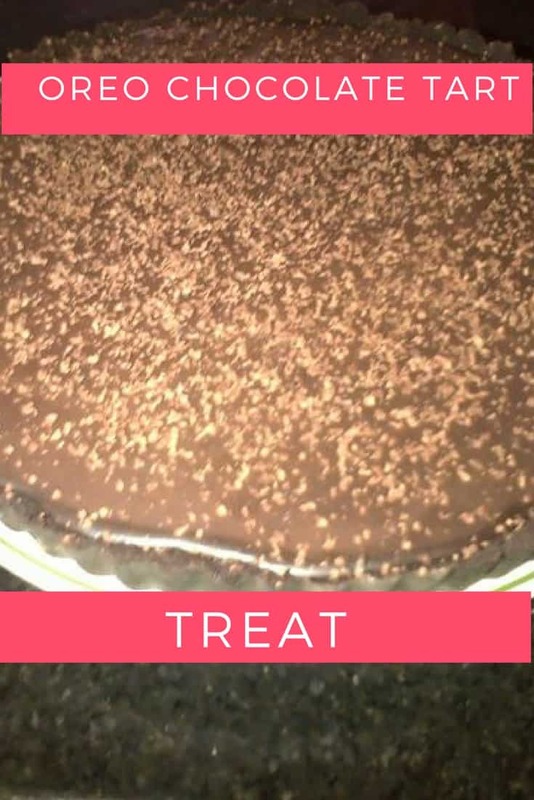 Now run a piece of baking parchment or grease-proof paper under the cold tap, wring it out and place the damp, crumpled piece right on top of the chocolate mixture, then put the jug into the fridge for 15 minutes. Pour and scrape the mixture into the biscuit-lined flan tin and put back in the fridge overnight. Don’t leave it longer than 24 hours, as the base will start to soften. Take out of the fridge for 10 minutes before serving, but unmould straight away.